MEC trains Mechanical (ME), Industrial Production (IP) and Automobile (AU) Engineering candidates for success in GATE (Graduate Aptitude Test in Engineering), IES, PSU etc. MEC emphasise on conceptual learning and enable students to realize true potential with the help of structured course material, lectures, practice papers, weekly tests, rank improvement tests and final test series. Batch for RRB, SSC, MPPGCL, FCI, NTPC for JE rank posts has begun from 13th February 2019. Admissions open in Classroom Rank Improvement Program for GATE 2020 beginning from 16-07-2019. 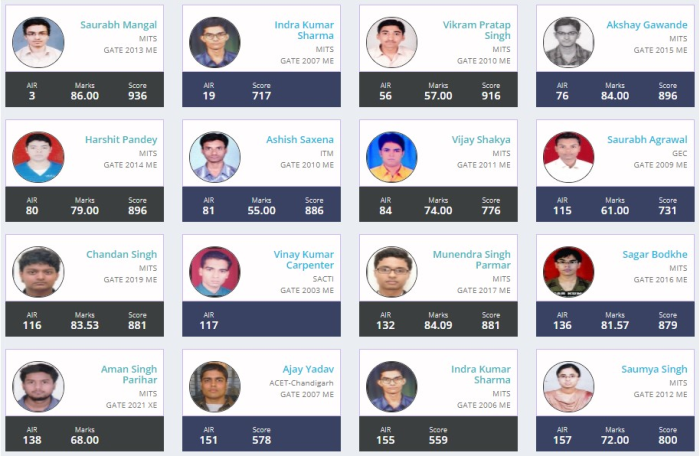 GATE 2019 result highlights; Total 18+ selections, Success rate ~80%, MITS(100%); Top Ranks: Chandan Kumar 116, Arpit Gupta, 1026, Lohit Chaturvedi 1650, Pawan Kumar Lulla, 1854. Admission open in Batches for GATE 2020, 2021, 2022 beginning from 3rd June and 16th July.